On this day in 1722 one of the greatest disasters in British Naval Military History occured; the Scilly Naval Disaster. A British fleet returning from the siege of Toulon during the Wars of the Spanish Succession, left Gibraltar bound for Portsmouth in heavy seas and bad weather. Four ships of the line ran aground on the Isles of Scilly with the loss of 1,400 men. An enquiry established that the disaster was due to the inability of the fleet to calculate their Longitude. So began one of the greatest quests in maritime history. In 1714 a large prize was made available for the person who could solve the problem. It was not until 1767 that a Yorkshire carpenter and clock-maker, John Harrison was published as the winner. He began by constructing massive clocks, perfected his technique and won the price with what looks remarkably like a large watch. The principles, in particular the circular balance, underpinned the world of horology until the development of electronic systems. At the same time as Harrison was working in England Pierre Le Roy invented the detente escapement in France, another essential of the accurate chronometer. 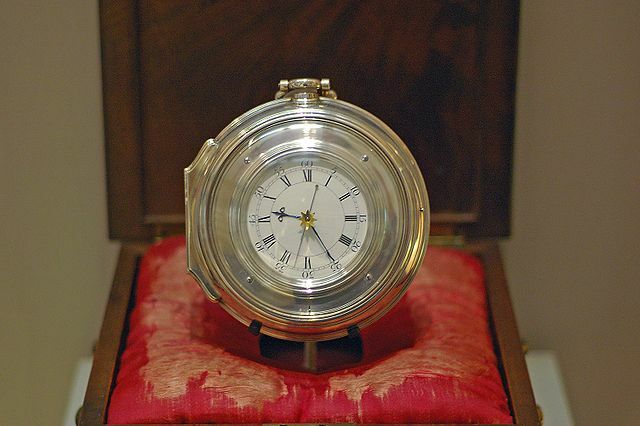 The invention of the Chronometer allowed explorers like James Cook to map the world accurately, and delivered an advantage to the British Admiralty which enabled the development of the British Empire. It seems such a little thing, but it is very important to know exactly where you are. I find a similar dynamic in operation in the Business World. Many business owners know where they want to be, but struggle with how to get there, because they have a limited understanding of where they are now. If you fully under stand your present position, and know where you want to get to, the intervening steps become very simple to map. Those steps are what we call a ‘business plan’. That mapping is the core of what I do in the workplace. Today is a foggy day both physically and metaphorically. A white mist lies across the land and across my mind. The one across my mind is a result of a stinking cold, a very upset stomach, and some powerful drugs. As a result I am not feeling lucid enough to write a long post. So I give you a foggy poem. As I recall this was given to us as examples of personification and alliteration when learning poetry criticism in school. Stay well clear of cruel, hungry foam. Instead pour yourself a beer and marvel at that cool and thirsty foam winking merrily at you from the top of the welcoming glass 🙂 Now, I must go and call those cattle home!